The annual recognition of Oxford graduates will take place Saturday, May 6, at 10 a.m. on the Oxford quad. Approximately 320 students will celebrate their Oxford experience before moving on to Emory's Atlanta campus for the completion of their undergraduate degrees. 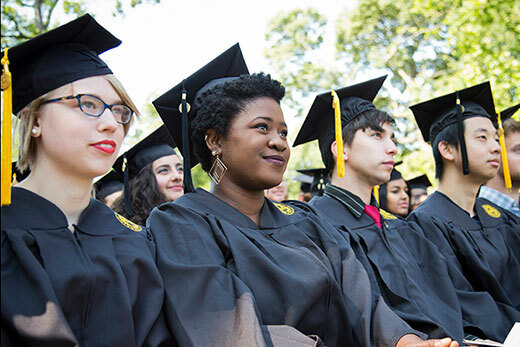 Oxford College will observe its 172nd Commencement exercises on Saturday, May 6. The ceremony honors approximately 320 Oxford students, who will celebrate their Oxford experience before completing their undergraduate degrees at Emory University’s Atlanta campus. Following their two years at Oxford, students enter Emory College of Arts and Sciences, the Nell Hodgson Woodruff School of Nursing or the Goizueta Business School for the completion of their undergraduate degrees. Emory University President Claire E. Sterk and Interim Dean of Emory College Michael Elliott will join Oxford College Dean Douglas A. Hicks in presiding over the ceremony, which will begin at 10 a.m. on the Oxford quad. * Students, families, and others in attendance will hear the keynote address delivered by Teresa M. Rivero 85Ox 87B 93MPH. Marching in procession with the Oxford graduates and faculty will be members of the Oxford College class of 1967, the newest members of the Golden Robes, alumni whose graduation year was 50 or more years ago. A highlight of the day will be the awarding of the Emory Williams Teaching Award, presented to a faculty member, and the Virgil Y.C. Eady Sophomore Award, presented to a student in recognition of outstanding service to Oxford College. Teresa M. Rivero, lead senior program officer with the Bill and Melinda Gates Foundation and an Emory University trustee, will deliver the keynote address. As part of the Gates Foundation’s College-Ready Team, Rivero focuses on systems grant-making that strives to raise the national high school graduation rate and help all students graduate prepared for college. Rivero is a graduate of Emory, where she earned a BBA in finance and a master’s degree in public health. She has also served on the Emory Alumni Board, including a term as president. On Friday evening, May 5, an interfaith baccalaureate service will be held in historic Old Church, just north of the Oxford campus. Following the event, graduates and their families are invited to join a dinner on the grounds of Haygood residence hall. For the first time, Oxford will offer live streaming of Commencement exercises. View the live ceremony at 10 a.m. EDT on Saturday, May 6 (livestreaming starts at 9:30 a.m.). For complete details on the week’s events, visit the Oxford Commencement pages. * An inclement weather advisory will be implemented, should weather present a problem on May 6.